The online Credential of Readiness (CORe) program will prepare you to contribute to business discussions and decision-making, whether you're looking to advance your career, considering graduate school, or exploring new career paths. CORe consists of three courses—Business Analytics, Economics for Managers, and Financial Accounting —and a final exam. Immerse yourself in real challenges faced by seasoned leaders across a variety of industries, develop business intuition through interactive learning exercises, and join a global community of peers. As in the business world, you’ll be evaluated on the quality and timeliness of your work and your contributions to the learning community. Professor Jan Hammond is the Jesse Philips Professor of Manufacturing and Senior Associate Dean for Culture and Community at Harvard Business School. She currently teaches Supply Chain Management in the MBA program and is program chair for the HBS Executive Education International Women’s Foundation and Women’s Leadership Programs. Her research focuses on speed and flexibility in manufacturing and logistics systems to respond to changing customer demand. Professor Bharat Anand is the Henry R. Byers Professor of Business Administration for Harvard Business School and Harvard University’s Vice Provost for Advances in Learning. He is an expert in digital and corporate strategy, and has studied how new technologies affect what we watch, read, and hear—which you can learn more about in his book, The Content Trap: A Strategist’s Guide to Digital Change. He is a two-time recipient of Harvard Business School’s “Best Teacher” award. Professor V.G. Narayanan is the Thomas D. Casserly, Jr. Professor of Business Administration at Harvard Business School and chair of the MBA program’s second-year elective curriculum. He has served as the course head for the first-year required accounting course for MBA students, Financial Reporting and Control, and chairs several executive education programs. His research in management accounting focuses on understanding how firms can use incentives and feedback to improve performance. Get ready for the real world. Stand out from the crowd and impress during interviews as you prepare for your next opportunity. You can also earn undergraduate academic credit for CORe in select course starts. Get ready for your MBA or other graduate program with the online courses that Harvard Business School offers to incoming students to prepare for the MBA classroom. Add value to your organization and take your career to the next level with a deeper understanding of essential business concepts. Learn more about what Financial Aid options are available to you. Note: By enrolling in the CORe program, participants will be ineligible to enroll in Business Analytics, Economics for Managers, or Financial Accounting as individual certificate programs. By enrolling in the Business Analytics, Economics for Managers, or Financial Accounting certificate programs, participants will be ineligible to enroll in the CORe program. 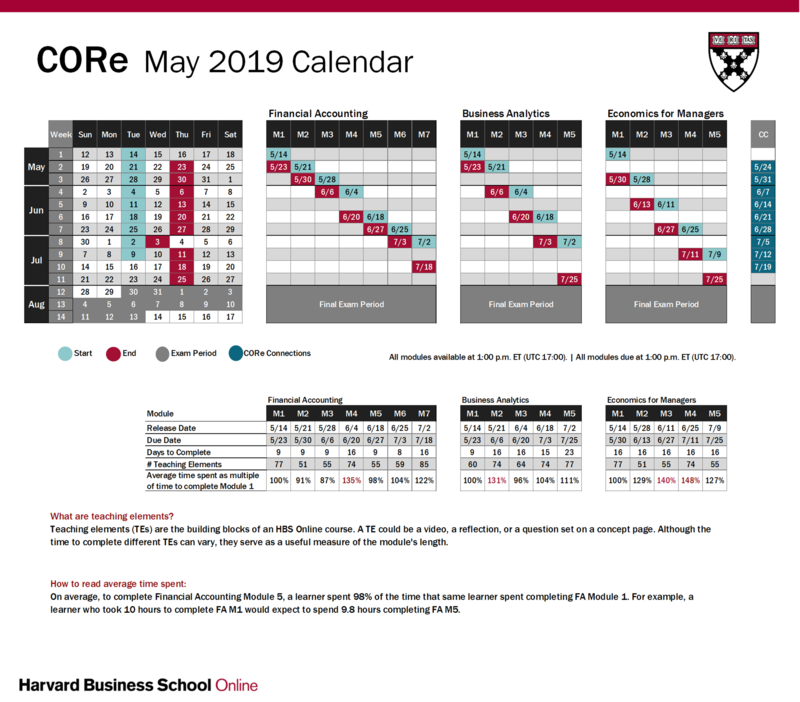 Developed by Harvard Business School faculty to bring the dynamism of the HBS classroom online, CORe immerses you in a series of multimedia case studies. You will step into the role of a business leader and learn concepts in the context of real business issues—actively challenging you to think on your feet—while sharing your ideas with fellow learners from around the world. You will walk away from CORe with a new perspective on the world and how businesses work. CORe was much more than a tripod of rigorous courses. The sense of community that developed from all the various social platforms that were unique to Harvard Business School Online that provided me the platform to interact with other students from all over the world in various industries were instrumental in my application and understanding of the concepts. CORe goes well beyond the basics, but it isn't overwhelming. The classes are structured in a way that each lesson builds on the lessons before to reinforce everything you've learned. CORe also provides you with real world examples that illustrate the concepts. It's one of the most impressively organized programs I've ever been a part of. Not only was I able to expand my network so that I know someone in every major city around the world, but it also helped me land a job at a company that I absolutely love. I enjoyed being able to interact with motivated, ambitious students from all over the world. Furthermore, the course content and platform were extremely engaging, combining the best of pedagogy and technology. Everything you need to know about CORe program fees, institutional need-based scholarships, and financing options. Enroll today in Harvard Business School Online’s world-class business fundamentals CORe program.